Peanut butter and banana is one of my all-time favorite pairings. It’s right up there with coffee & mornings and Meg Ryan & Tom Hanks. It’s just meant to be. 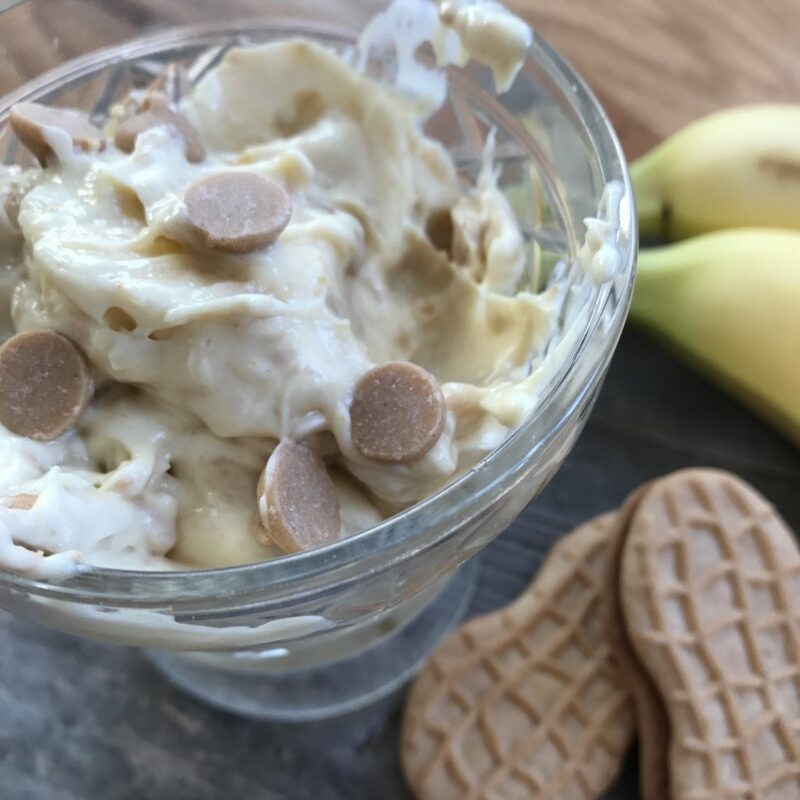 I’ve made Banana Split Fluff and Blueberry Cheesecake Yogurt “Salad” for the blog – but serve a few others on occasion including Cookie Salad (*spoiler alert – the salad contains no vegetables) 😉 and Pisatachio Fluff. 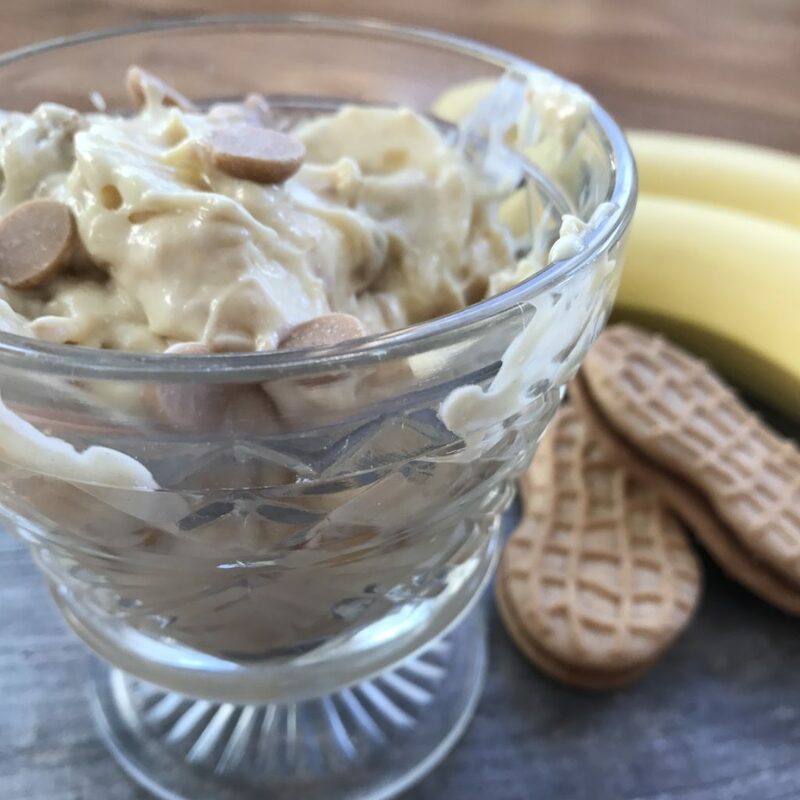 This is the perfect blend of peanut butter and banana, and has the smooth texture of the pudding mixed with the crunch of the cookies, the soft bite of the chips and bananas….it’s just so so good. Start by mixing up your banana pudding mix and milk. Whisk until the pudding is free of lumps. Refrigerate until the pudding begins to set. Once set, fold in the whipped topping. Stir in the crushed Nutter Butter cookies and peanut butter chips. Put the peanut butter in a microwave-safe bowl and microwave for about 30 seconds. Pour the melted peanut butter into the pudding. Mix well. Slice your bananas and fold those into the mix. Refrigerate until ready to serve. I never would have thought of this! So simple and delicious sounding.